(nee Lopez) fortified with the Sacraments of Holy Mother Church, Tues., Apr. 3, 2018. Beloved wife of the late John Soto and cherished wife of the late Herman Carmona, dear mother of John Soto Jr., Mary Rebecca (Roger) Delgado, Eugene (Nadiya) Soto, and Jessica (Michael) Liszewski, dear step-mother of Len (Donna) Carmona and Cindy (Karl) Meyer, dear grandmother of Angela (John) Gourley, Janice (Cary) Hunter, Patricia (Jeff) Lewis, Melissa (David) Fox, Ricardo (Jennifer) Delgado, Mario (Shelly) Delgado, Carlos Delgado, Michelle (Dave) Schaepperkoetter, Michael (Malena) Soto, Manuel (Sylvia) Soto, John (Emily) Soto, Katie Liszewski, Irina (Clay) Baumann, Sergio Soto, and Stacy (Matt) Herndon, dear great-grandmother of Laura, John Soto, Joanna, Sam, Nick, Robert, Marley, Maya, Manny, Dmytro, Lizzie, and Tyler, dear aunt, great-aunt, cousin, friend and neighbor. Services: Visitation and funeral Mass will be held Sat. Apr. 14 at Sts. Peter and Paul Catholic Church, 207 Vandalia St. Collinsville. Visitation at 9:30 a.m. with the Mass to follow at 10:30 a.m. Interment Jefferson Barracks Cemetery on Mon Apr. 16 at 11:15 a.m. In lieu of flowers, contributions to the Holy Spirit Adoration (Pink) Sisters, 1438 E. Warne Ave., St. Louis, MO 63107 or the Edwardsville Garden Club, P.O. Box 294, Edwardsville, IL 62025 appreciated. Services: Visitation and funeral Mass will be held Sat. Apr. 14 at Sts. Peter and Paul Catholic Church, 207 Vandalia St. Collinsville. Visitation at 9:30 a.m. with the Mass to follow at 10:30 a.m. Interment Jefferson Barracks Cemetery on Mon Apr. 16 at 11:15 a.m.
Aunt Mary was such a model of hospitality and love, always trying to feed us. Such a beautiful seamstress, loved to visit her and see her flower garden. I pray for peace for the family. 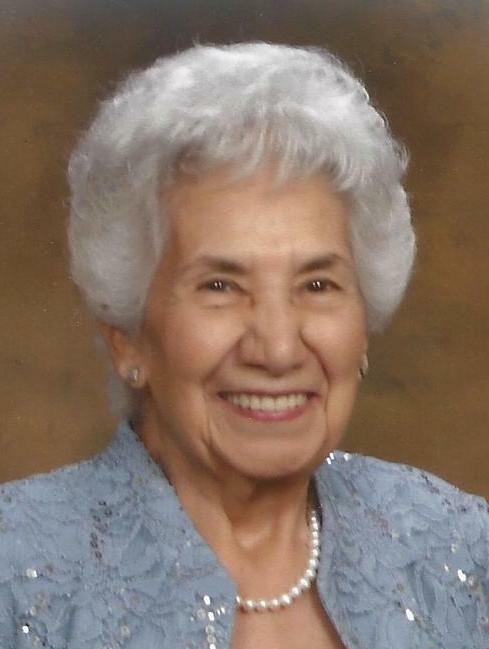 Dear Delgado, Soto, & Carmona Families, you have my deepest sympathy in the loss of Mary. She was a wonderful lady. My Mother, Kay Hampton, thought of her as a Sister and I thought of her as my Aunt. I have many wonderful and happy childhood memories living next door to her, John and the family in Baden. God bless you all with His peace and love.